Poets: Bashō. Hosai Ozaki. Jane Hirshfield. Marianna Monaco. Patricia Donegan. Patricia J. Machmiller. 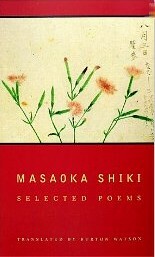 Shiki (haiku). Haiku written by Ozaki 1905-1926, presented in sequence written. "for the great majority of Japanese haiku writers and commentators, the haiku is a one-line poem". He quotes the critic Nihira Masaru: "'One-lineness is an indispensable part of the haiku form'". Also he quotes the critic Sugaya Kikuo: "The haiku is a poetic form based on the contradiction that, while making a bisectional structure an inherent part of it, it never externalizes that structure in a two-line poem". Sato concludes that as Ozaki's haiku were written in one line in their original Japanese, then that to have broken the English-language translations "into two or more lines may be not just unjustifiable but also misleading". English only; no kanji, kana, or romaji. Illustrations of small block prints. 21 pp. prose (micro essays) contain brief excerpts from 6 of the 7 essays in On Entering a Temple House. 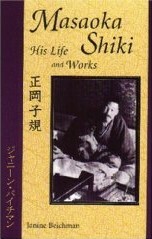 Sato's translation "maintains, wherever possible, the original word order, unique colloquial tone, and remarkable brevity of expression ... his [Ozaki's] discovery of meaning in the common and the elusive in life.